Pressure Grouting in North Carolina involves injecting grout into pre-drilled holes in order to strengthen, eliminate cracks, correct faults, and/or reduce water flow. Foundation problems including a wall crack or floor cracks, bowed walls, and water leakage can all be remedied using pressure grouting. Pressure grouting is an essential construction process for the specialists at Tar Heel Foundation Solutions to do wall crack repair and fix faulty foundations in North Carolina. 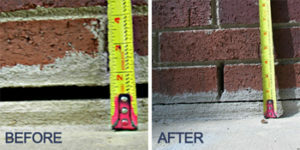 We offer comprehensive wall crack repair solutions.